The Misericordia University football team got a taste of victory when the Cougars closed their second varsity season with a 63-40 win over FDU-Florham. Now, as they enter their third season, the Cougars want more. 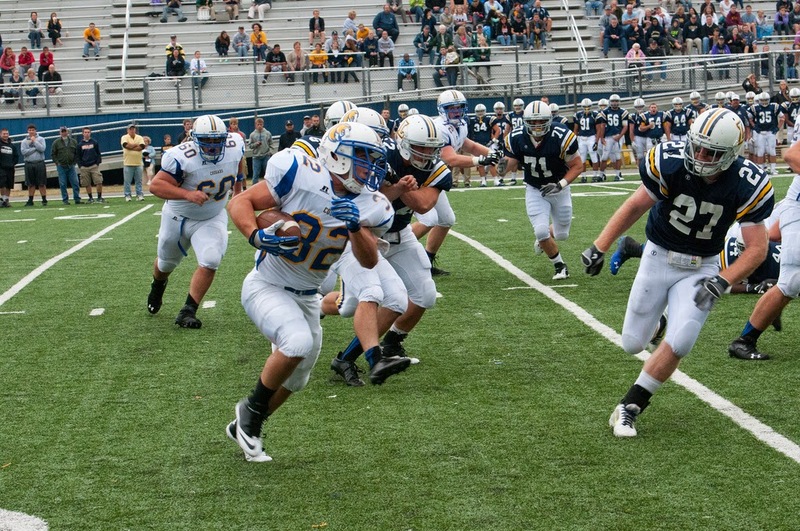 "We try to win every time we step on the field," said Misericordia head coach Mark Ross. "We continue to focus on trying to get better every day. We do have a goal to win more games than we did last year." The Cougars return 50 lettermen, including 25 veterans who have been with the program since its inception. "We are young, but we are experienced," said Ross. "Our sophomores and juniors have seen a lot of game action in two years and there is no substitute for that type of experience." A key to this year's success will be the offensive line where five veterans, with an average weight of 290 pounds, are expected to pave the way. Two-time All-MAC performer John Ameen will be joined by Connor Duffy, Alec Garrity,Matt Henderson and Sam Johnson. Lining up behind them is junior quarterback, Jeff Puckett, an honorable mention All-MAC selection a year ago. "Puckett is a two-year starter and he keeps getting better," said Ross. "He works as hard as anyone I've ever seen and it shows in his game." Sophomore Ryan Kurtz was impressive in spot duty as a freshman and will back-up Puckett along with newcomer Brandon Leap. "Kurtz does some good things and he proved that he can play last year," said Ross. "We need to find some ways to use him." Junior Robin Custodio, a two-year letterman, steps into the starting role at tailback while sophomore transfer Michael Cheslock and first-year player Mark Rainey will provide depth. As the Cougars seek to achieve balance in their offensive attack, a veteran group of receivers should make that job easier. Junior Tom Stelzer is a two-year letterman at tight end while classmate Dylan Kluber and sophomores Alec Rhoads and Nick Smith provide experienced depth. "We have a good group of tight ends," said Ross. "They are all battle tested." Junior Juwan Petties-Jackson returns at wide receiver along with classmates Tyler Rowe and Kurt Kowalski. "Petties-Jackson is a veteran and provides us with a legitimate deep threat," said Ross. "Rowe is a smart player who can play multiple positions and Kowalski is tough kid." Sophomore Colton Pyne also returns at wide receiver while first-year player Randy Custodio adds depth. "Pyne is bigger than most receivers and can do a lot of different things," said Ross. "He is a tough match-up for defenses. Custodio is really quick in the open field." Ross hopes his squad can take advantage of their experience. "Our starters have played together and proven that they can perform at a high level and we think they will have success," said Ross. "We have good depth at quarterback and receiver, but we'll need some young guys to step up and contribute at running back and on the offensive line." On the other side of the ball, the MU defense is getting bigger and stronger. "Our defense is really coming along," said the Ross. "The talent level and depth are the best we've had. Guys are showing that they can make tough plays and we will be able to play more people." Sophomores Chris Grevas and Donald Bender return at nose tackle while junior Ben Muschlitz and sophomore Cory Dickerson are back at defensive end. Newcomers Fredo Santorelli and Thomas Anderson will provide depth at defensive end. Austin Deinarowicz and Dom Picarillo are battling for one outside linebacker spot while Omar Clark and Tim Martin are competing at the other side. Veterans Hunter Pates, Chris Hutter, Rob Hart and Sean Weg are all challenging for the inside linebacker spots while first-year Jordan Aquino adds depth. Kevin Bagasevich and Anthony Buffa return at cornerback while sophomore Matt Martin and transfer Anthony Vega have impressed. Newcomer Tyler Collins could also see time at corner back. "Bagasevich is a smart player who reacts very well," said Ross. "Buffa is really coming into his own as he gains experience." Brandon Salazar provides experience at free safety with Tyler Hessert and Brian Hart also in the mix. Sophomore Isaiah Harvey and transfer Zak LaNunziata will occupy the strong safety position. "We expect a lot out of the strong safety position," said Ross. "We need to play well at that position for us to be successful." Returning starter Patrick Newins will handle the placekicking and punting duties with Ryan Davis and Adam Strogis providing depth. Petties-Jackson tops a group of kick returners that includes Randy Custodio, Klayton Kelly, Rainey and Tanner Coleman. Randy Custodio and Kelly will likely handle the punt return duties. "We need to improve as a team throughout our special teams," said Ross. "We need to take advantage of our depth and make more plays on special teams as we try to win the field position battle." Another area of emphasis for the Cougars is playing a full 60 minutes. "We need to get off to a good start," said Ross. "If we do that, we will give ourselves an opportunity to be competitive into the fourth quarter which will give us a chance to win."